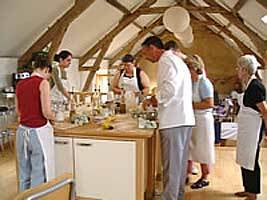 Masterchef finalist, Jim Fisher, took his cutting-edge skills and enviable chefing experience (such as chefing for Rick Stein) to the rural Dordogne, where, with the help of his wife, Lucy, he has established a thriving cookery holiday business amongst their beautiful stone farm buildings at Bombel. Jim and Lucy invited me to join them and their guests for a week, so that I could find out exactly how the holidays work. I thoroughly enjoyed myself, learning new skills, tasting lots of superb food, and getting to know the other guests and our hosts. Heres what happened . . .
Transport issues meant that I arrived rudely early on the first day, but although it was too early for me to see straight, I was welcomed by a relaxed and smiling Lucy, who seemed as if shed been up for hours. The converted barn which houses the gorgeously decorated professional kitchen was warm and comfortable. Lucy and I chatted as I got to know the surroundings, while she made a constant supply of tea and checked on the freshly baking croissants and pains au chocolat. Gradually, the six other guests and Jim himself drifted up to the mezzanine kitchen. Lucy laid the dining table, and we all went down to eat the delicious pastries with freshly ground coffee and mugs of malty tea. The mixture of people was fantastic; an English girl, an Australian couple, an Irish lady who lives locally, and a mum and daughter from Texas. Everyone had such interesting stories and points of view to talk about, but the best thing about the people on the course was that everyone was pleased to learn and get along, and no-one had anything to prove. After the leisurely breakfast, everyone went upstairs and cleared away the breakfast things, before getting stuck in to making fresh pasta. The courses which Jim runs are not limited to the local cuisine and ingredients, and he is happy to take requests for demonstrations. The menu for a weeks holiday is different every time, not just because the meals are designed around guests requirements and requests, but because Jim changes plans according to how people are feeling and the availability of ingredients. 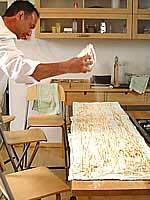 Everyone was amazed at their own achievements, as Jim effortlessly showed us how to make pasta from scratch. We used our tagliatelle and sheet pasta for two dishes; aromatic tagliatelle with a rocket and almond pesto, drizzled in olive oil, and tasty ravioli, which was filled with rocket, lemon, feta and black olive, and served on a chunky, spicy tomato sauce. Delicious! 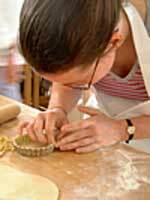 But the pasta was the first of countless skills that we would master throughout the week. By the end of the holiday, everyone knew how to fillet a fish, prepare mussels and squid, butcher a duck, roast the perfect leg of lamb (with orange and garlic) make perfect pastry, tarte au citron and creme brulee, concoct the best ice-cream Ive ever tasted (one was toffee, the other was basil flavoured), select ingredients and much, much more. Simple tips from the expert transformed peoples approaches to everyday tasks like zesting and chopping. From my point of view, a disinterest in ice-cream has switched to the fact that I have to have a proper ice-cream machine (now), whilst my disastrous pastry, which I thought was a hopeless cause, is now light, malleable, and stays in one piece! Another highlight for me was Jim demonstrating how the flavours in a sauce change as it reduces, and ingredients like salt, fruit juice or oil are added. Vast quantities of salt and fat in processed foods are consumed unnoticed, but the relatively small amounts of salt and oil in fresh food shocked guests, who are normally very careful about adding these ingredients to their food. Jim would make everyone taste a sauce or filling, add salt or oil or sugar to it, and make us all taste it again. The flavour would explode in our mouths, the difference being immense. Then Jim added more salt and asked us to taste it, and then more salt again. Conservative salt consumers loved the new flavours, which were simply massively enhanced, rather than actually being salty / sweet / oily, and their attitudes to ingredients were changed forever. 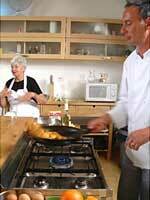 Despite all the learning, the experience of a Cook in France holiday is extremely relaxing. Long lunch breaks chilling out on the lawn, gazing at the wonderful view or basking in the pool, plenty of breaks, afternoons-off to explore, trips to local markets for ingredients, and a lack of pressure to join in if youre not in the mood mean that there is plenty of balance. Eating what we had cooked was extremely satisfying, and everyone enjoyed swapping cross-continental foodie tips over lunch, but Jim can also recommend a whole range of reliably good local restaurants if you fancy an evening out. This French holiday is an enjoyable experience for anyone with an interest in food. It must be good for you, too, because in the year since the courses have been running, two babies have - allegedly - been conceived there. The wine is free! This article was written by Gemma Driver, a food writer and consultant, who is passionate about the French way of life and now lives in the Dordogne after moving to France several years ago.